Kadima co-founder Haim Ramon may be joined by Tzipi Livni. Kadima may split in two. Chaim Ramon, a former Minister of Justice and one of Kadima's founders, has announced he will establish a new party to compete with Kadima. Ramon's move could hasten a split within Kadima, whose more leftist MKs have been mulling such a move ever since MK Shaul Mofaz was chosen to head the party. There is speculation that Tzipi Livni, who headed Kadima before Mofaz, will join Ramon's new party. 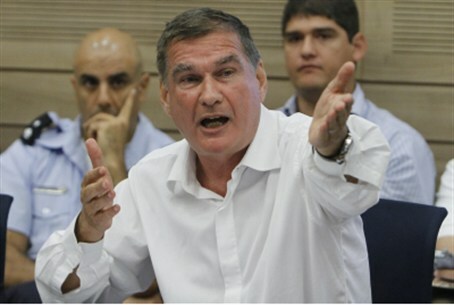 In an interview with IDF Radio, Ramon attacked Kadima Chairman Shaul Mofaz for staying in Netanyahu's government despite the disbanding of the Plesner Committee for equality in enlistment. "The present prime minister is the problem," said Ramon, "He has been fooling the entire public for three years. Netanyahu's allies are the settlers and the Arabs. The alternative [to the Likud] must replace Kadima." "Everyone understands who Netanyahu is now, and the masks have all been removed," Ramon said. "There needs to be an alternative that will replace Netanyahu. I can count off 20 people who can replace Netanyahu. Every one of them knows how to take care of things better than Netanyahu." Ramon said neither Yair Lapid nor Labor is a true alternative to Netanyahu. Lapid will not garner more than 10 seats in the next Knesset, he estimated, whereas Labor head Shelly Yechimovich is in cahoots with Netanyahu. "Shelly Yechimovich is Netanyahu's partner. Why doesn’t she attack him? A few days before they decided on early elections she had already closed a deal for partnership with Netanyahu," he accused. Ramon, who was sentenced to community service in 2007 over an incident involving a female soldier and an undesired kiss, will probably not head the new party himself.